During the period 2003-2012 two peaks in uranium price occured: In 2007, speculators pushed the price of uranium to something higher than 120 US$/pound. By 2011, uranium was trading at 68 US$/pound, until the Fukushima disaster brought the price back to the range of 40-60 US$/pound. Factors supposed to be affecting uranium prices are on the one hand cheaper and more plentiful natural gas, on the other hand rising costs of nuclear plant construction. The world's biggest uranium reserves are currently located in Canada, Australia, Kazakhstan, Russia, Niger, Namibia, and Uzbekistan. 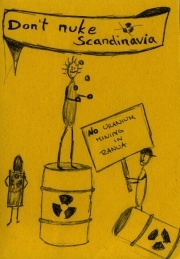 In Europe today no uranium is mined apart from small amounts in the Czech Republic and Romania. Since the world market price of uranium oxide (U3O8) has been tripled between 2000 and 2003 to 66 EUR per kilogram a new run to exploit even poor uranium reserves has been started. Additionally according to the IAEA the demand for uranium is much higher than the uranium mined worldwide since many years. By now this demand could be substituted by the old nuclear weapon's fission materials, but this "resource" will be mostly exploited soon. For a uranium deposit, the lower limit of a large deposit is 1,000 tons of contained uranium (UNESCO 1984; GTK Spec. Paper 35, 2006). In case of a discovery, the exploration phase is followed by inventory drilling, feasibility studies etc. in order to develop a deposit to a mine. The GTK (Geological Survey of Finland) stated in 2006 that the presently known Finnish deposits were to poor and small to be economically exploited. They said that there should be deposits of at least about 5,000 t uranium at 0.1 % Uranium or better (although they questioned if it would be economically to exploit those deposits) or better about 10,000 t uranium at 1 % Uranium or better. In Pécs a state-run uranium mine existed from 1957 to 1998, within 10km of the borders of the city of 160,000 people. A successful recultivation program has been undertaken, but continuous monitoring and removal of uranium from the water refilling the mine shafts and leaking from the tailings is ongoing. The uranium obtained in this way is sold to AREVA, through Nukem, though this is a very small amount (approx.1 ton per annum). Olympic Dam, located in the South Australian desert outside the town of Roxby Downs, is Australia's biggest uranium resource. The mine is on the land of the Kokatha people and draws water from the land of the Arabunna people. In 2005 BHP Billiton (BHPB) took over Western Mining Corporation inheriting not only ownership of Olympic Dam but the Roxby Indenture Act. This allows for extravafant exceptions to environmental and cultural heritage legislation protection. BHPB plans to make Olympic Dam the largest open-cut mine in the world by digging a pit of about 20 cubic kms. Export of uranium is expected to increase from an average of 4000 tonnes per year to 19,000 tonnes per year and production of copper, gold and silver is also expected to increase. Tailings: The production of radioactive tailings, stored above ground, will increase to 70 million tonnes annually. Currently, tailings are producted at a rate of 10 million tonnes annually and the stockpile amounts to 100 million tonnes. The tailings dam contain a toxic, acidic soup of radionuclides and heavy metals and are responsible for large numbers of bird deaths - over 100 deaths in a four-days period in 2004. There have been numerous spills and leaks - most significantly in 1994, when it was revealed that three billion litres had leaked from the tailings dams over two years. Water: BHP Billiton proposes an increase in water consumption from 35 million litres daily (from the Great Artesian Basin) to 150 million litres daily (up to 42 million litres from the Great Artesian Basin, the remainder from a proposed desalination plant at Port Bonython). The water take from the Great Artesian Basin had adverse impacts on the precious Mound Springs and needs to be reduced or stopped altogether. BHP Billiton pays nothing for its massive water take despite recording a profit of A$ 22 billion in 2007/08. Electricity: Electricity demand for the mine will increase from 120 megawatts to 690 megawatts - equivalent to 42 % of South Australia's current total electricity consumption. Electricity will be supplied from the SA grid and/or an on-site gas-fired plant, with no government requirement or company plans for any electricity to be supplied from renewable energy sources. Nuclear Weapons Proliferation: There is an unacceptable risk of uranium from Roxby Downs finding its way into nuclear weapons. Accounting discrepancies involving Australia's uranium exports are common. International Atomic Energy Agency Director-General Dr. Mohamed El Baradei has acknowledged that the IAEA's rights of inspection are "fairly limited", that the 'safeguards' system is subject to "vulnerabilities" and "clearly needs reinforcement", that efforts to improve the system have been "half-hearted", and that the safeguards system operates on a "shoestring budget ... comparable to a local police department". Uranium production at Roxby is expected to increase to 19,000 tonnes per year, sufficient to fuel 95 power reactors which will produce 18.5 tonnes of plutonium each year - enough for 2,850 nuclear weapons each year. Canada's uranium mining industry began in 1931 when prospector Gilbert Labine discovered pitchblende near Great Bear Lake in the Northwest Territories. Canada is a major player in the uranium scene due to high grade uranium found in the Athabasca region of Saskatchewan. Uranium is typically found in sedimentary basins. Canada is home to some of the world's high grade projects: Athabasca Basin (Alberta/Saskatchewan), Thelon Basin (N.W.T./Nunavut), Baker Lake Basin (Nunavut), Angikuni Basin (Nunavut), Yathkyed Basin (Nunavut). The Athabasca Basin in Saskatchewan 2011 supplied some 19 % of the world's total uranium output. Jadugoda, located in the mineral-rich Singhbum district of Jharkhand, is the chief source of Uranium in India, providing fuel for the nuclear reactors. However, the uranium comes at a colossal human cost. In this case, those paying the price are adivasis (indigenous population), the Santhal, Munda and Ho tribes. Due to the proximity of the mine, a large number of villagers suffer from cancer, skin diseases, physical deformities, blindness, brain damage, disruption of menstrual cycle or loss of fertility. Villagers, evicted from their lands, work as miners and are exposed to a heavy dose of radiation. Uranium Corporation of India Limited (UCIL), responsible for operating the mine refutes the allegations and refuses to acknowledge the problems. However, independent researchers believe that it is difficult to conceive of any reason, other than radiation, for the human and environmental catastrophe. On December 24, 2006, one of the pipes carrying radioactive wastes from the uranium mill to a storage dam had burst, discharging highly toxic wastes into a nearby creek. When released into the environment in such a hazardous manner, the radioactive wastes are deadly to the people living in the surrounding area as well as their land and water. The accident occurred in Dungridih – a small village near Jadugoda inhabited largely by displaced families whose lands were acquired to construct two of the three storage dams, also known as tailings ponds. The tailings ponds store all the radioactive wastes generated by the milling of uranium ore in Jadugoda. Based on the experience of similar accidents in other countries, however, the negative effects on human and environmental health will impact communities living downstream, perhaps even hundreds of kilometers away. Therefore, it is imperative that the Uranium Company of India Limited (UCIL) – the owner and operator of the uranium mine, mill, pipes, and tailing ponds in Jadugoda – immediately inform downstream communities of the disaster and prevent them from using the creek water until it is certifiably safe. Until the creek is safe to use, UCIL should supply water to the impacted communities so that they can continue their necessary activities such as bathing and washing clothes. Also, UCIL may need to provide compensation for families living downstream whose livelihoods depend upon the stream, a tributary to the Subarnarekha River, either for irrigation or fishing. This 2007 report by the The Indian Doctors For Peace And Development (IDPD) documents the health effects on Indigenous people in India living in close proximity to a uranium mining operation. The study was carried out by a team of medical doctors using 34 trained fact-gatherers. Data was gathered from all the 2,118 households in five villages close to the mines, and was compared with data from all 1,904 households in villages 30-35 km away from the mines. The statistically significant results show increases in congenital deformities, sterility, cancers, and shortened life span among those living close to the mines. An Australian company, Wildhorse Energy, appeared in Pécs at the end of the 2000's, with the goal of doing exploratory drilling and reopening the mine. For years nothing happened, but recently a partnership agreement was established between Wildhorse and the remnants of the former state mining company with the explicit goal of restarting uranium mining next to and directly under the city of Pécs. On February 7, 2012, a cooperative agreement (contract) was signed by the two state-owned Hungarian companies (Mecsekérc Zrt., and Mecsek-Öko Zrt.) which were incorporated after the closure of uranium mining activities in Pécs, and an Australian company, Wildhorse Energy, with the explicit goal of restarting uranium mining in the Mecsek Hills around and underneath the city of Pécs, in southwestern Hungary. On March 29, 2012, in spite of an attempt to keep the question from becoming public, the local government was pressured by citizens to delay voting on a proposal to allow explorative drilling by the company on city property, immediately bordering lots with private homes. On June 26, 2012, the Hungarian government officially sanctioned the creation of a joint state-private initiative to explore the reopening of the uranium mine on the edge of Pécs. This is to be directly overseen by Mrs. László Németh, Minister of Development. The government directive states that the new corporation will complete a study of the feasibility of uranium mining in the Mecsek Hills, upon which the government will base its decision to support the project or not. Volumes of greenhouse gases are emitted throughout the nuclear chain from mining, milling, transporting, building nuclear power plants and reprocessing uranium for use in weapons and nuclear power. Uranium is the heaviest of all minerals. The percentage of uranium to ore is quite small in commercially mined uranium, averaging 0.3 % in Australia but as high as 15 % in Canada. The ore is, therefore, milled to concentrate the uranium, resulting in a marketable product, uranium oxide (U3O8), also known as 'yellowcake'. Radon is a radioactive gas released from uranium decay. In Australia three kinds of mining process are used to extract uranium: underground (as currently used at Olympic Dam), surface (open pit, as used at Ranger), or acid solution/in-situ leach (as used at Beverley). Tunnel mining poses risks to both human health and environment. Besides the risk of collapse and poor or dangerous air quality in underground operations, uranium mines present a dangerous scenario for workers due to exposure to radon gas and uranium dust. After ore extraction, uranium must be separated from the other minerals in the matrix. This is done by crushing and leaching the rock using water and sulfuric acid. This process uses enormous amounts of water which is contaminated with acid, unwanted minerals and leftover uranium, and contains long lived decay products which continue to pose a risk to health and environment. It is left on site in tailing dams, in an attempt to minimise dust and because there is no safe means of disposal. The sludge that tailing water covers is 85% as radioactive as the uranium extracted and it continues to release the deadly radon gas. Tailing dams all over the world have had leakage problems. There are many documented instances of increased exposure to radiation in people living downstream from these tailings damas through consuming contaminated water, fish and crops. Local wildlife, particularly water birds, have also been killed by drinking the tailings water. The health and environment effects are felt in many mining communities worldwide. Recent reports from China indicate that there are both serious health impacts on communities living near uranium mines and grave consequences for workers who speak out on the issue. Navajo homelands in the US are a notable example of former mining communities where residents now experience high lung cancer rates. Over half of the groundwater is contaminated by defunct uranium mines. Workers and the community are exposed to serious health risks at all stages of the nuclear chain from mining to transport, use and disposal of nuclear materials including waste. Workers are at risk from radiation exposure through inhalation of radioactive dust or direct contamination from the mine. The permitted levels of radiation exposure considered 'safe' for workers and the public have dropped dramatically over the years as research indicates harmful effects still exist at much lower exposure levels than what was originally thought to be safe. It is now acknowledged that there is no safe level of radiation exposure that guarantees cancer will not be triggered. Globally, the nuclear industry has a history of developing uranium mines, nuclear tests, and waste dumps on indigenous people's lands against their wishes. Australia is not different. Unfortunately, lack of infrastructure and investment in remote areas, has allowed mining companies to pressure indigenous communities to permit mining on their sacred lands, in exchange for basic services like school and hospitals. Royalties are often an enticement in areas where poverty and lack of services prevail due to government neglect. Victims of occupational exposures in Germany are not well situated in our experience because compensation of occupational diseases has to be done by a trade association called “Berufsgenossenschaften” which are to be organized and supplied by the employers. The physicians who have to evaluate the disease of the worker as occupational are usually not independent if occupied in one of those great enterprises which have their own company doctors. This is the case in nuclear enterprises. Moreover, there is a great deficit in accepting the health effects by low dose exposures of ionizing radiation for historical reasons. It is well known that the so-called peaceful use of nuclear energy followed the development of the atomic bomb. Many experiments about the health effects of nuclear radiation in the early period were done under military auspices and the results were kept a secret for decades in order not to disturb the use of this technique. There was always consent in this field between the Western and the Eastern world also during the time of the Cold War, and on conferences you heard the same phrases about negligible damages if keeping the radioactive rays in the limits which they propose. Such rare concordance between the interests of the Western nations and the former Soviet Union and its satelletites was continued up to now. An example is the international official denial of Chernobyl damages in large populations which is also adopted by the World Health Organisation (WHO) – against local and well documented scientific evidences (Busby 2009; Pflugbeil 2006). The international public is certainly convinced that the WHO is an independent institution which has the only aim to identify health risks for the people and to serve for protection and prevention. But that is not the whole truth. In 1956 the United Nations organisation (UN) founded the International Atomic Energy Agency (IAEA) as an institution to promote the world-wide introduction of nuclear power for industrial purposes with their head quarter in Vienna. They are also engaged in exchanging information about the side-effects for health, but, of course, in order to maintain the benefits of these techniques. This organisation made an agreement with the WHO which is also a foundation of the UN. This contract between IAEA and WHO reduces the evaluation of radiation risks to concordance with the promotion of nuclear power. What are the aims and the problems of uranium mining? One wants to gain the isotope uranium-235 which is suitable for nuclear fission. (Nuclear fission delivers the desired energy). It is, however, only 0.7 % of the uranium in natural composition. Therefore, one has to gain a lot of uranium ore. The highest amount of radioactivity in uranium ore is given by the main isotope uranium-238. Uranium-238 is not only radiating itself but also produced a series of radioactive daughter elements which all are existing in the ore. The main problems for the surroundings of the ore are radium and radon, because radium binds easily to soluble substances and will be washed out by rain and goes to ground water. Radon is gaseous und leaves the mineral at open surfaces and is in the air to be inhaled. Its half-life is only short, 3.8 days, but it is continuously produced again by radium. The radiations of the nuclides in Table 1 are alpha-, beta- and gamma-rays. Gamma-rays are penetrating matter, they are very similar to x-rays. Beta- and alpha-rays are high energetic particles with electrical charge. All these rays produce mutations in tissues. Alpha-rays are of high biological effectiveness if they can get into the body via the lungs or into the stomach. Fig.1 shows tracks of single alpha particles sent out by radium. The path length in air is some centimeters, in tissue it would be only 1/1000 of that: some 10 micrometers. They are only dangerous if incorporated. Prof. Dr. Inge Schmitz-Feuerhake is a physicist and worked for some decades in the field of radiation dosimetry and radiation protection at the university of Bremen. She was also involved in cases at court of potential radiation-induced diseases after occupational exposure. After her retirement from the university in 2000 she continued her efforts in the German Society of Radiation Protection which is a NGO, a non govermental and non-profit group. One of the aims is to support victims of occupational exposures as for instance those from uranium mining in the former German Democratic Republic in Eastern Germany. This text is an extract of her lecture hold at the Independent's experts' hearing on uranium mining impacts in Ranua. Tailing Pond for the waste water from the milling process. On the front you see radioactive uranium waste. A field of sludge in the process of drying. Here the radioactive water continues in an open canal towards the Bengali bay, according to the locals. This is a child who was born disformed and their head and hand are twisted. Most of their siblings are dead, and they also had disformations before dying. Find more articles about Uranium on the Nuclear Heritage Network webpage. This page was last modified on 21 February 2017, at 16:39.